VANCOUVER, BC – R&B Brewing has announced details of the latest release in its Mount Pleasant Series of limited edition beers, named for the East Vancouver neighbourhood where the brewery has been located since opening in 1997. Our new Mt. Pleasant series #9 release was inspired by autumn, and full flavoured juicy hops. 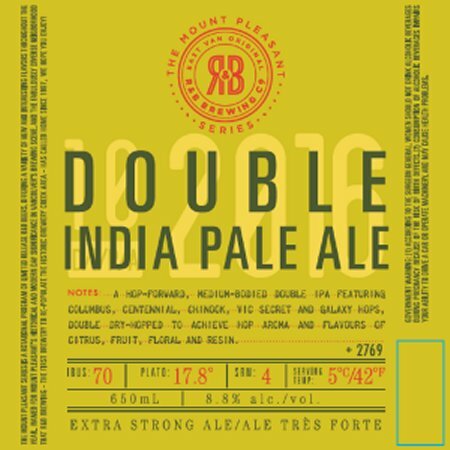 The Mount Pleasant Double IPA is a complex, yet balanced India Pale Ale with a simple malt profile and deep hop aromas, brewed with Columbus, Centennial, Chinook, Vic Secret and Galaxy hops. The ale is double dry hopped to achieve hop aroma with flavours of citrus, tropical fruit, floral and resin, which gives this beer its specific flavour profile. Mount Pleasant Double IPA will be available on tap at the R&B growler station and in a limited run of 650 ml bottles while supplies last.